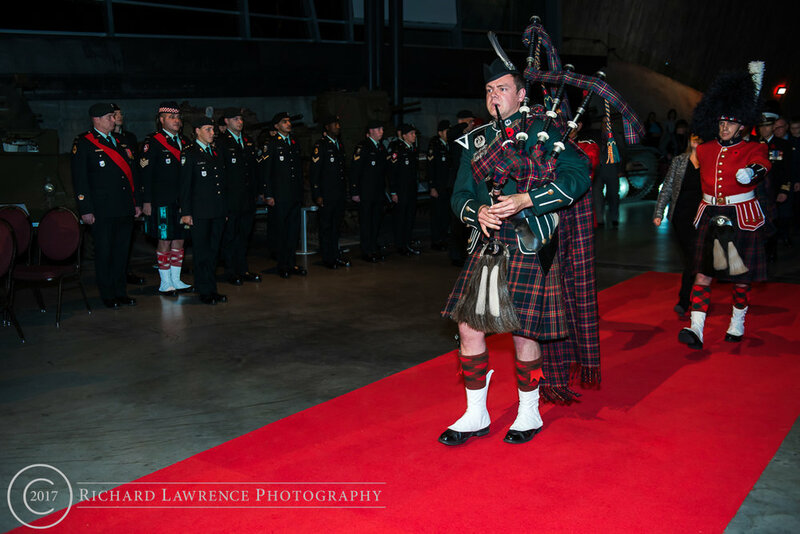 The Canadian War Museum once again hosted the Candlelight Tribute for Veterans on Monday night, 6th November, 2017, to a full house of veterans and families in the Lebreton Gallery. The Ottawa Police Chorus serenaded the crowd prior to the start of the ceremony and the entrance of the Official Party. The official party of the evening included of the Parliamentary Secretary for Veterans Affairs, the Honourable Sherry Romanado, the Mayor of Ottawa, His Worship Jim Watson, the Director General, Naval Force Development, RCN, Commodore Casper Donovan, and the President and CEO of the Canadian Museum of History and Canadian War Museum, Mr. Mark O’Neill. The Ceremony started with the laying of wreaths followed by the youth of Canada, represented mostly by the Cadets, War Amps, and Scouts organizations, taking candles given by the seated veterans and placing them on the front stage in front of the wreaths previously laid. There were then brief addresses from Mr. O’Neill and Commodore Donovan followed by the Act of Remembrance, Commitment to Remember, the lament, silence and rouse. The remembrance portion of the program completed, the Mayor rose to award a street sign to the family of a veteran who will have a street in Ottawa named in his/her honour. 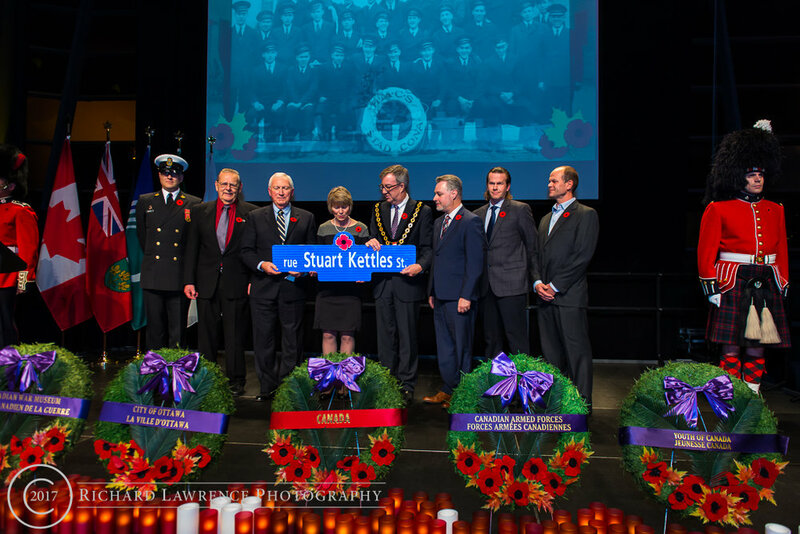 This year, the honour of having a street named after a veteran was bestowed upon the family of Leading Writer Stuart Alexander Kettles, an Ottawa born World War II veteran who passed away 20th May, 1966. Mr. Kettles was born in 1917 and joined the Royal Canadian Naval Reserve in 1941. He was posted to the H.M.C.S Athabaskan in 1942 until the Athabaskan was sunk on 30th April, 1944, after which he was taken as a prisoner of war (POW) to Germany for the next year. During his time as a POW he kept a diary detailing the daily life of those captured. After the war, Mr. Kettles continued to serve the community with the Ottawa Police Services from 1946 until 1966. The street, Stuart Kettles Street, is located in Bayward Ward. Following the street name presentation the Mayor proclaimed 5-11 November as Veterans Week and exchanged the framed proclamation with a framed copy of the Veterans Week poster from the Parliamentary Secretary. Ms. Romanado then addressed the veterans before passing the stage to the Canterbury High School Chamber Choir and the Governor General’s Foot Guard Band to end the program.